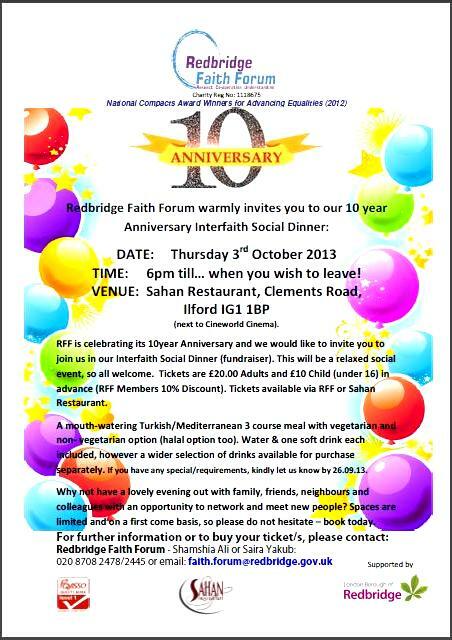 Redbridge Faith Forum is 10 years old (as is LBFN) this year and is celebrating in style. They have kindly invited well-wishers to join them at their party on Thursday 3rd October at the Sahan Restaurant, Clements Road, Ilford IG1 1BP. Download the flyer here, which has all the details. This entry was posted in Redbridge by Catriona Robertson. Bookmark the permalink.